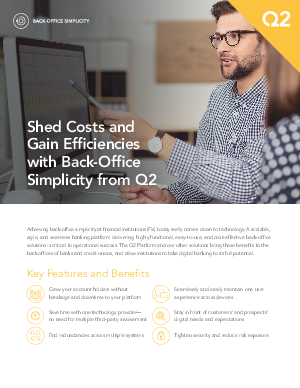 The Q2 digital banking platform delivers highly functional, easy-to-use, and cost-effective back-office solutions to produce operational efficiencies and empower staff to focus on growth. Automated tools for online account opening, compliance and dispute resolution, and security are among these solutions. This guide discusses them and others, sharing insights on how to bring easier digital banking administration and improved operational success to banks and credit unions.